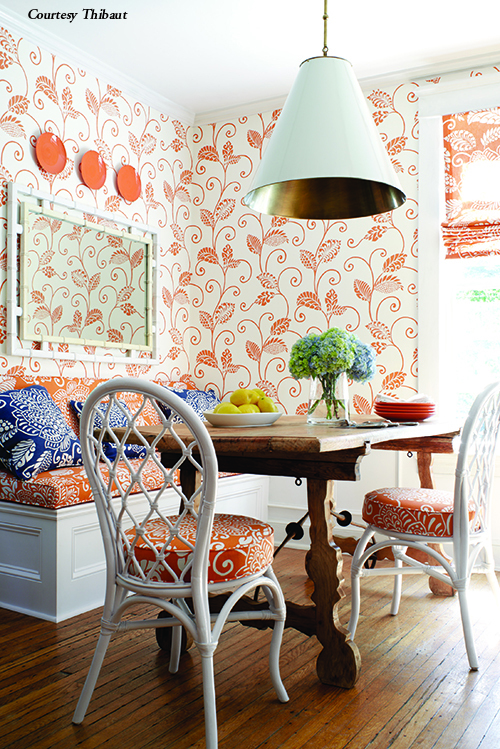 Experts report homeowners are favoring a broad range of color choices and are also mixing patterns and artisan accents. Those same authorities report that homeowners are extending their lives into outdoor spaces, and design is following suit with indoor-outdoor fabrics on upholstered pieces and a focus on neutral, earth tones and subtle understated patterns in fabric design. “Linen is by far my clients’ first choice at present for window coverings, says Teresa Zilinsky of Teresa Zilinsky Interior Design. “We also use linen a great deal on beds and pillows. Linen is an organic fabric that has a gorgeous durable luxurious look and feel.” She adds that neutral colors such as soft grays, creams, taupe, and whites add to the natural feel of the fabric. Jones says chintz is making a comeback and for home decorators who don’t like the feel of chintz florals are still available in more textural fabrics. “Tropical leaves have been trending over the past few seasons, as well,” she reports. In addition to natural fibers, indoor-outdoor fabrics are continuing to rise in popularity due to the fabric’s durability and versatility. The popularity of indoor-outdoor fabrics—also called performance fabrics—allows designers to accomplish designs that provide both aesthetic and practical benefits. “They are easycare, fade resistant, bleach tolerant, and are now being created for indoor spaces,” Jones says. Jones says animal prints never go out of style, and that the current trend is snake and alligator reflective patterns, while animals themselves are showing up in prints. Countering the trend toward natural fabrics, Jones says jewel tones and velvets are making a comeback. 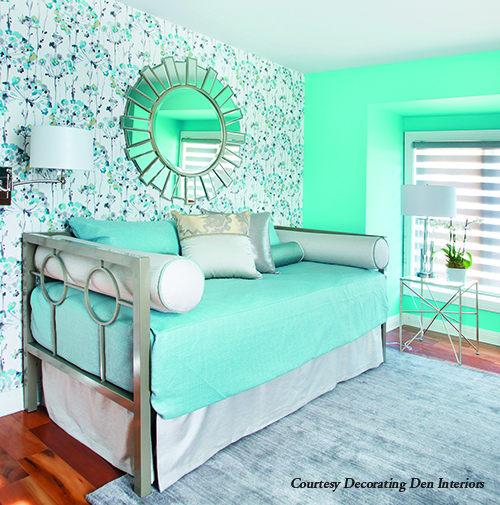 “Pink is a hot color for interiors, and teal continues to be a color favorite. Both work well with grays and other neutrals,” she adds. Another trend on the horizon may be geometric patterns that are blocky and bold, being used tocompliment classic touches. Additionally, moiré silk, which is an older classic and features a rippled texture, is being used in new ways such as covering a modern chair or a plain wall. 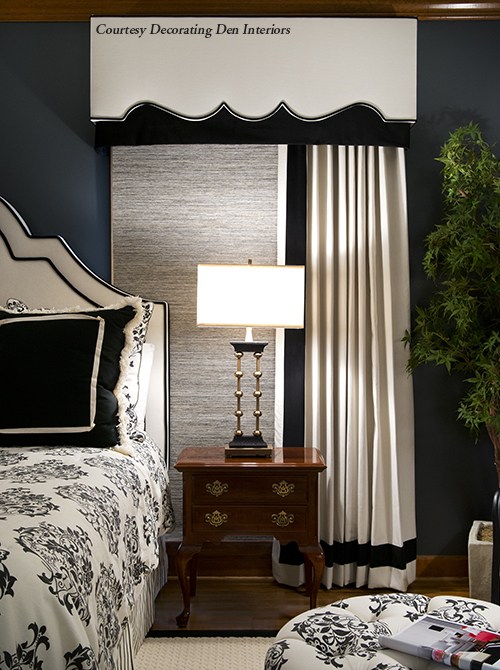 Mixing patterns with solids is a growing trend, according to Amanda Sweeney of Just Design This. 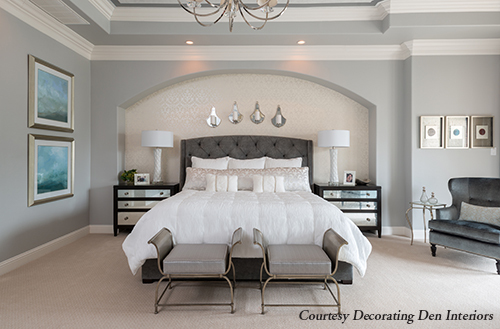 She adds that mixing soft fabrics with rough textures adds depth and dimension toa space. Print mixing enhances the combination of hard and soft by placing prints and colors that traditionally clash in relationship to each other. 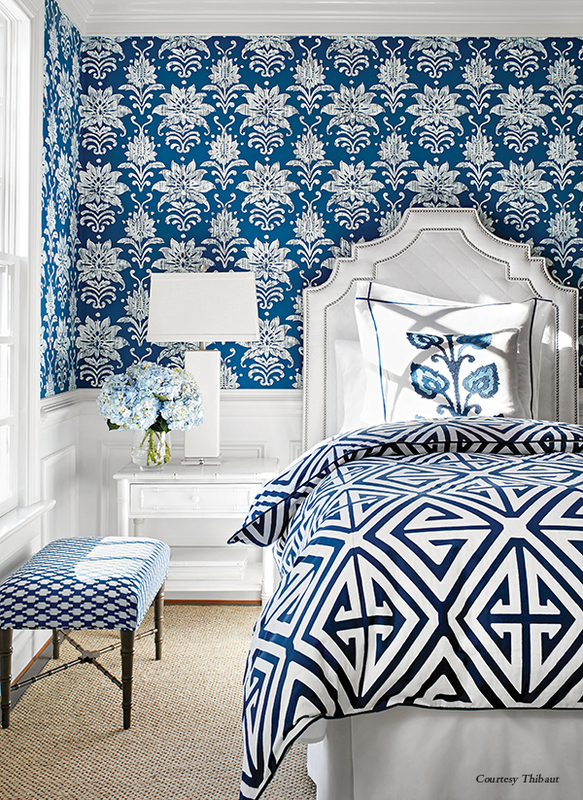 The right patterns mixed together can anchor a design and be the statement a room requires. Experts suggest the key to print mixing is odd numbers. Odd numbers—especially the number three—just seem to make things work, whether you’re combining colors or planting shrubs. The key to successful mixing is to vary the scale, from small to large, of the patterns. 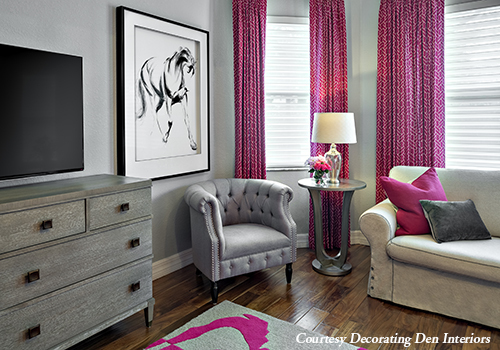 A room should haveechos of colors selected, even if they are quite modest and understated. Experts agree that fabric trends in 2017 are focused on bold and fresh, clean with a pop of color. With a steady interest in linens and natural fabrics and neutral palettes, the focus of colors and patterns is on accenting and highlighting the natural beauty of the space. The starkness of an all white or black and white space is on the decline and what’s taking its place is accents of color to warm the space. Navy, along with lighter shades of blue such as powder blue and periwinkle, and greens are particularly seeing a rise, as well as an interest in the psychology of color. Regardless of how you choose your color and texture, the combination of color, print, and texture makes design fabric choices an opportunity for expression.